Club Penguin Cheats by Mimo777 Club Penguin Cheats by Mimo777: Club Penguin Red Alert From G! Go to the Everyday Phoning Facility... Pronto! Boy...you post fast. I just got the message from G which is weird. 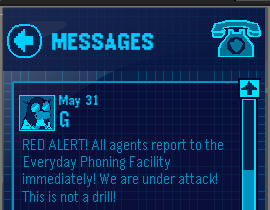 I never get a spy phone message while i'm actually playing cp. But that was like 10 minutes ago. You are constantly updating! there is a glitch in the pet shop. the whole screen is blank! Herbert works on Spanish servers! look at the petshop the screen is white!!! Uh mimo when i went to the cove the medieval music was playing pretty weird but i like the music so i dont really care! Everytime I play the game and almost defeat Herbert (ie I've almost defeated the last monster), it takes me straight back to the EPF room. Its so unfair cos I've tried loads of times and can never win! My stealth gear has stopped working as well I think CP has a glitch. I bought it today and I can't use it. How do you beat Herberrt !?!?? !